The individual race will be something to watch as defending champion, Christian Knowlton, looks to retain his title, but it won't come easy as the youngest coach Charlie Kern Sr. Kern boy, Ethan Kern, has shown that he is in much better shape than he was last year at this time. 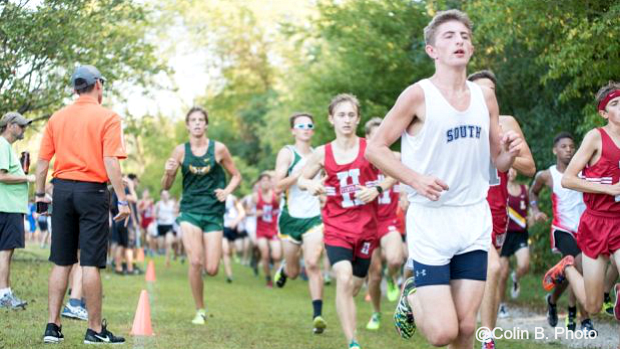 Kern was demoted to the Frosh/Soph race as his fellow sophomore teammate, Daniel Klysh, was in the varsity race. Kern used this demotion as fuel and won the Frosh/Soph race with a 16:24. Kern was impressive at the Detweiller At Dark in July running 15:12 to take 4th place. Kern has closely followed by teammate and fellow threat to Knowlton's title, Daniel Klysh, who ran a 15:13 to take 6th place. Knowlton is looking to be in great shape as he won the Plainfield City Invite on a rough course with a time of 15:58. The chase pack behind these three runners should include the likes of Timmy Wade (Plainfield South), Joseph Wermes (Fenwick), Jonathan Stiglic (Lincoln-Way West), James Sottosanto (Plainfield South), Julian Mines (Joliet Central), Jay Dworak (Joliet Central), Austin Ivec (Plainfield South), Connor O'Keefe (Benet Academy), Matt Solucha (Glenbard North), Marat Schatz (Glenbard North), Kyle Bell (Providence Catholic), Jimmy Grill (Providence Catholic), Ben Cook (St. Charles North), Brian Pratt (York), and Will Lathrop (Plainfield South). The girl's side will feature a great battle between two of the state's very best girls as MacKenzie Brownrigg (Lincoln-Way Central) and Isabelle Christiansen (Oswego) will go head to head. Brownrigg should be making her season debut as she did not race at the SWSC Pre-Conference Meet. Last year Brownigg ran great here last year by taking 2nd place and beat Christiansen. This season has been solid thus far for Christiansen who has run in three competitions with a best of 17:26. The chase pack behind Christiansen and Brownrigg should include Anika Brennan (Jones), Katie Murray (Jones), Merrigan Allen (Lincoln-Way Central), Rachel Baumgartner (Lincoln-Way Central), Julia Rushing (Neuqua Valley), Caitlin Guist (Oswego), Ella Hale (Oswego), and Cassidy Martin (Plainfield South). The team race should be easy money for Oswego as they are by far the best team in this race. Watch for Lincoln-Way Central to come back strong after falling out of the rankings this past weekend.